The Center is located on the Douglass Residential College Campus in a two-building grouping called the Women's Scholarship and Leadership Complex. 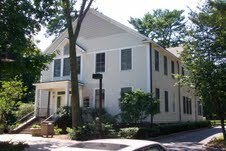 It is on the first floor of the smaller building called the Center for Women's Programs, which is closer to the street (Ryders Lane). Entry is at the "rear" of the building, off of the common patio. Parking information is noted in the driving directions below. For those arriving by car, please contact the office a few days prior to your arrival so that we may arrange a guest pass for parking. From Pennsylvania Station (34th Street and 7th Avenue) take a New Jersey Transit train on the Northeast Corridor Line to New Brunswick, NJ. (Tel: 1-800-722-2222, http://www.njtransit.com) You can then take a taxi to the Center. NEW JERSEY TURNPIKE: Take exit 9 and follow signs for "Route 18 North/New Brunswick." Continue with ROUTE 18 NORTH directions below. ROUTE 18 NORTH: Take George St./Douglass College exit. Proceed up exit ramp, staying to your left and enter a traffic circle. Exit the circle about half way around (first place to exit) and proceed onto Ryders Lane. Stay on Ryders Lane for about a quarter of a mile. The Women's Scholarship and Leadership Complex, which includes the Center for Women's Programs, is on your left. Parking is in lot 71A, on the left about 50 yards past the buildings. ROUTE 18 SOUTH: At the first traffic light after the John Lynch Bridge, turn right onto Commercial Avenue. At the first light, turn left onto George Street. Proceed through the next traffic light, and make the next right (the road will be bending left, you will make a right onto Ryders Lane/Clifton Avenue). Stay on Ryders Lane for about a quarter of a mile. The Women's Scholarship and Leadership Complex, which includes the Center for Women's Programs, is on your left. Parking is in lot 71A just beyond the entrance to the buildings. FROM U.S. ROUTE 1 SOUTH: About a mile after passing the major intersection of Routes 1 and 130, take the "Ryders Lane/New Brunswick" exit which is just beyond an overpass. On Ryders Lane proceed through the first light (Labor Center Way). Parking lot 71A is on the right. After parking, turn right out of the lot, and follow the sidewalk to the Women's Complex. FROM U.S. ROUTE 1 NORTH: About ¾ of a mile past On the Border restaurant and Sears, take the "Ryders Lane/New Brunswick" exit. On Ryders Lane proceed through the first light (Labor Center Way). Parking lot 71A is on the right. After parking, turn right out of the lot, and follow the sidewalk to the Women's Complex. ROUTE 287: Take exit 9. Sign reads "514 Spur, River Road/Bound Brook/Highland Park." Proceed east on River Road toward Highland Park to the fifth traffic light (approximately 3.4 miles), the major intersection at Metlars Lane. Turn right at the light onto the John Lynch Bridge (Route 18 South) and cross the Raritan River. Continue with ROUTE 18 SOUTH directions noted above.